These lovely birds are very common on rivers in central and southern Britain, where they feed on aquatic insects and small fishes. We have even seen Kingfishers perched beside our small garden pond, where there are no fish but plenty of insects for them to feed on. 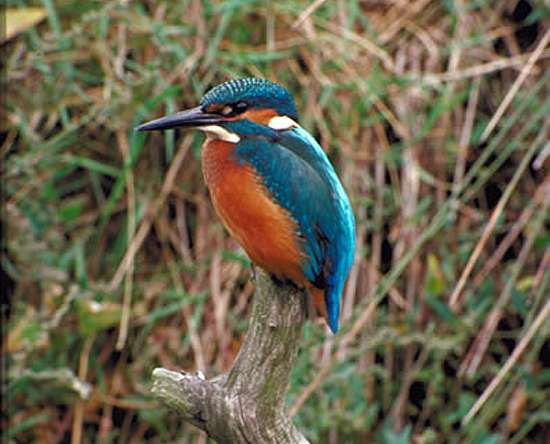 The male and female kingfisher are almost identical in appearance, but at least half of the lower bill of the female is reddish. (The bird in this picture on the left is a female.) Their bright blue and orange plumage appears irridescent in sunlight, making the sighting of a Kingfisher a heartlifting experience. Kingfishers nest at the end of burrows, usually about a metre long, dug into steep, sandy riverbanks. The nest itself is made from dried fish bones. There they produce two or occasionally three broods of typically four to six youngsters each time. Because they eat more than half their bodyweight each day, Kingfishers have to work hard to find enough food. They have monocular vision when out of the water, which means their two eyes operate independently; however, once under the surface they switch to binocular vision. 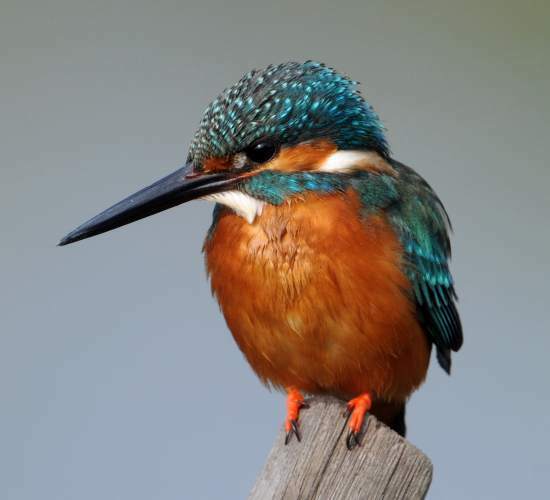 Although they can live up to 20 years, very few Kingfishers survive for more than two or three years. This page includes pictures kindly contributed by the Countryside Council for Wales and Ray Tipper.